Oh, to be in the souk bargaining with an olive merchant, while chickens destined for the pot scurry around your feet. I’ve never been to Morocco, but if the mysterious flavors of its cuisine are any indication, I must visit. 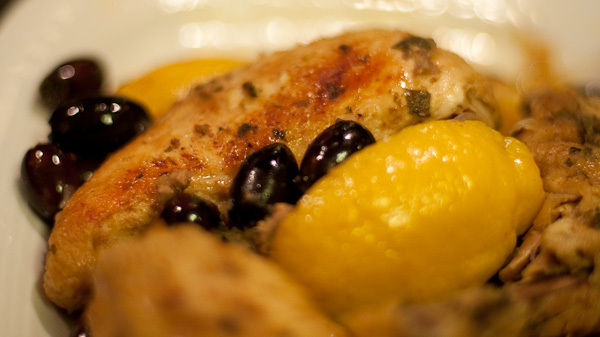 One of the classic combinations is a tagine of chicken with lemon and olives. 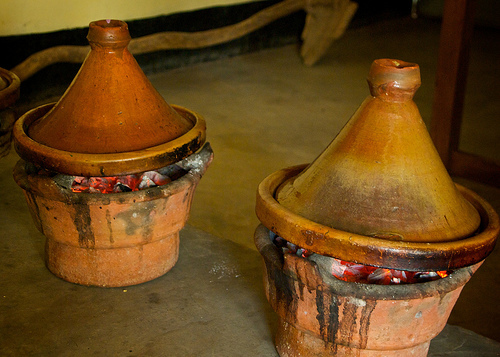 A tagine is a North African clay cooking vessel, with a tall conical cover that looks a bit like a sorcerer’s hat. The shape of the top encourages condensation, keeping the food inside moist as it cooks. Tagine is also what you call the dish that is cooked in said vessel, usually a slow braise of meat, poultry or fish with fruits, vegetables and exotic spices. Essentially, a tagine is a stew, and so is Morocco. Separated from Europe only by the narrow Strait of Gibraltar, it has long been one of the great crossroads of the world. Many peoples have come and gone over thousands of years, each leaving an influence on the culture and the food. The first inhabitants were the indigenous North Africans, the Berbers, or as they call themselves, the Imazighen. As early as the 6th Century, BCE, Phoenician traders established colonies in what is now Morocco. The next group to add their spice to the pot were the Romans. In fact, several famous Romans are known to have been Berbers, including the author Apuleius and the great church father Saint Augustine. In the 7th Century, CE, the Arabs conquered what is now Morocco, introducing Islam to the local Berber population. Over the next 800 years there was much influence, culinary and otherwise, from the Iberian peninsula whence many Muslims and Jews fled as the European Christians slowly re-took area from the Arabs. The Portuguese had an additional brief influence in Morocco during the early 16th Century as they spread their wings to explore the globe. In the late 19th Century, France and Spain turned their eyes to Morocco’s weak government, expressing concern about instability in this geographically strategic area. These countries were also very interested in expanding their colonial powers and Morocco was a known source of wealth. By 1912, most of Morocco was declared a French Protectorate with a smaller Spanish Protectorate in the northern part of the country. This remained in place until 1956 when Morocco gained its independence. For a dish with so many strong flavors this version of chicken with lemon and olives (called Djej Emshemel in Morocco) is surprisingly subtle and well balanced. The preserved lemons (do cut them up and eat them, peel and all) are like a burst of perfume in the mouth, and the mashed chicken liver in the sauce anchors the whole dish with a rich bass note. This one is definitely going on the dinner party list. While the total cooking time is on the order of two and a half hours, most of that is not active time in the kitchen, leaving you with plenty of time to set the table and put the flowers in a vase. In a traditional Moroccan meal you might begin with some refreshing salads, perhaps an eggplant puree with cumin and paprika, and maybe a Spanish-influenced mixture of tomatoes and roasted green peppers with preserved lemon. Outside of Morocco, tagines are often served with couscous, but according to Moroccan food expert Paula Wolfert, the couscous, which has been steamed over, and eventually combined with, a lamb broth including meat and vegetables, is traditionally served at the end of the meal. The most appropriate thing to serve with the tagine is flat, round, moroccan bread which is fairly easy to make at home. If you have access to a middle eastern bakery, Turkish bread is fairly similar, or in a pinch, nice fresh pita bread will do for soaking up the rich, lemony sauce. If you don’t have a tagine (the pot), you can still make a tagine (the food). A heavy dutch oven with a cover works very well. You can find preserved lemons in specialty food shops, and they are also very easy to make yourself. The day before serving, cut the chicken into 4 pieces, wash the pieces in salted water, and drain. Use a mortar and pestle to make a paste using 2 of your cloves of garlic and 1 tablespoon of kosher salt. Rub the chicken pieces with the paste, then rinse the paste off under cool running water until the garlic smell is gone. Drain. This is a traditional Moroccan way of preparing poultry for cooking which is said to remove bitter flavors and bring out the taste of the chicken. Make a marinade by mixing together the following: the remaining clove of garlic, thinly sliced, ½ teaspoon of sea salt, the ginger, paprika, cumin, black pepper, and vegetable or peanut oil. Coat the chicken and the chicken liver in the marinade, cover and chill for 24 hours. Put the chicken, its liver, and the marinade in a heavy dutch oven. Gently pulverize your saffron threads in a mortar and pestle. When you have ⅛ of a teaspoon, pour a little water in the mortar and let it stand a moment. Add ¼ cup of the grated onion to the dutch oven along with the saffron water, cilantro and parsley, and 1½ cups of water. Bring it to a boil and then turn the heat down to a simmer and cover. Turn the pieces of chicken frequently in the liquid while simmering for 30 minutes. While the chicken is simmering, pit the olives if necessary and rinse and drain them. When the chicken has finished simmering, remove the chicken liver from the casserole and mash it finely. Return the liver to the pot along with the rest of the grated onions. Check the level of the braising liquid and add some water if it doesn’t come halfway up the chicken pieces. Partially cover the pot and simmer until the chicken is very tender and the meat is falling from the bone, about an hour and a half. When the chicken is done, rinse the preserved lemon and quarter it. Add the preserved lemon and the olives to the pot and cook for about 10 minutes, uncovered, to combine the flavors. Remove the chicken pieces, olives, and preserved lemon to a serving platter, cover to keep warm. Turn the heat up and reduce the sauce to about ¾ cup. Add the juice of 1 fresh lemon to the sauce. Taste it and adjust the seasoning with salt and/or more fresh lemon juice if necessary.